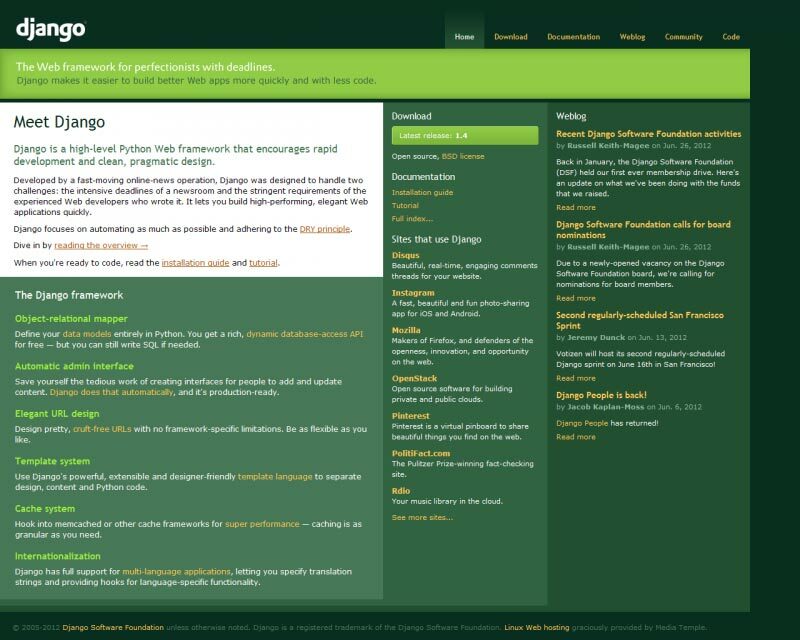 The Django Python Web Framework is a high-level python framework designed for quick and easy deployment of websites designed using the Python programming language. With Django, you can build almost any kind of website as they provide the tools and framework you need for highly usable websites. In order to use Django for your website, you need a Django web hosting provider that meets all the necessary requirements for a complete Django install. Your Django web hosting provider will need to support Python and a database system such as SQLLite, MySQL, PostGreSQL, or Oracle. To help you find the best Django web hosting providers out there, we’ve compiled a list of all the ones in our index that meet these requirements. Each of the web hosting providers listed above meet or exceed the requirements for Django web hosting and have been ordered based on popularity amongst users. Additionally, other hosts in our index may also carry the features required for Django web hosting simply by supporting the features: MySQL and Python that are required for installing and running a Django Python Web Framework based web site. Moreover, these web hosts may not yet be featured in our index. If you’d like to improve the rankings for other web hosting providers as it pertains to Django, you can do so by visiting our top 10 list above and clicking on the thumbs up and thumbs down buttons to submit your vote. If you know of any additional Django web hosting providers not currently listed on our site, please feel free to submit them to us here. For a view of our overall top 10 listing, visit our overall top 10 web hosting providers listing. If you’re looking for Cheap Django Web Hosting Providers, check out our top 10 cheap web hosting providers list. After all, why spend more? Compare and save! Not sure if Django is the right web site package for your site? We don’t blame you for being cautious. With so many compelling options out there it’s tough to know whether the Django Python Web Framework is best suited to your particular new site. To help out, we’ve researched Django and we’ve put together 5 compelling reasons why you should consider Django and subsequently Django web hosting for your web site. Django is a high level python framework that allows you to build quick and clean websites from the ground up using modern programming techniques. Django is built for fast moving websites with a focus on quality development. It allows you to build quality online systems quickly and easily. Django is fully open source meaning you can feel free to make any changes you want without having to worry about future license fees. Django has an extremely powerful and extensible template language that allows your designers to build quality designs without slowing down the efforts of the development team building the application. Django has an excellent history for security, so you can build your site and rest easy that you won’t be shut down by hackers who maliciously target your website. When it comes to setting up your new website, choosing the right package for the job is key. Since you’re already here looking at our listing of Django web hosting providers, you’re obviously interested in Django and Django web hosting. To learn more details about Django we’ve included a link to their website, a brief description of the package, and also a listing of requirements to be supported for a web hosting provider to be capable of Django web hosting. Django Description: Django is a high-level Python Web framework that encourages rapid development and clean, pragmatic design. Developed four years ago by a fast-moving online-news operation, Django was designed to handle two challenges: the intensive deadlines of a newsroom and the stringent requirements of the experienced Web developers who wrote it. It lets you build high-performing, elegant Web applications quickly.